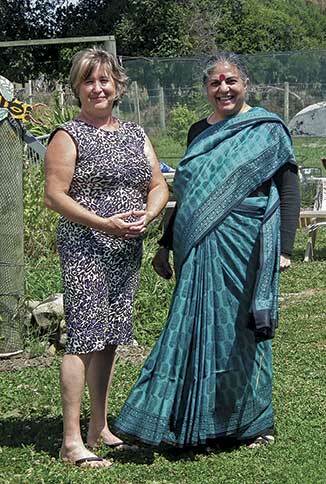 Networking and relationship building was delivered in abundance at the Te Kura-a-iwi o Whakatupuranga Rua Mano,(WRM) garden, as they hosted notable international manuhiri (visitors) and local growers. The Otaki Mail wrote about the garden last October, noting the diversity of vegetables, and how the children were learning about where food comes from, about nutrition and self-sufficiency. 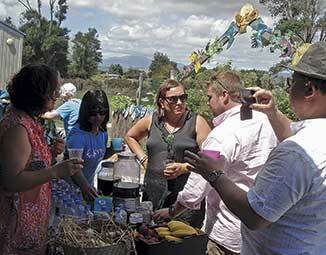 The invited guests were a group of celebrated food academics, travelling the country on a conference tour Food Matters Aoteaoroa. Under discussion were the impacts of modern technologies and agricultural methods on sustainable organic food growing. The group was welcomed with a mihi whakatau from Sean Bennett- Ogden, junior science teacher at the kura and responded to by film-maker Wiremu Grace. As part of the ceremony Koha were offered including taewa māori, a variety of fruit grown at Takapuwahia maara kai, as well as the recently translated into English book, by two guests, Jerome and Serrallini : Culinary pleasures, or hidden poisons, which details the conversations between a chef and scientist, linking the absence of taste to chemical intrusion. Speakers included Hemaima Wiremu, who discussed how they used rongoā from red Matipo, Karamu, Kawakawa and Koromiko, handed down with tikanga connected back to traditional Māori ways. We all tried the rongoā with considerable interest. I was particularly taken with the Koromiko decoction, which is widely known among māori to have benefits to sufferers of eczema and rashes. The importance of providing daily learning opportunities in nature is an important step towards normalising rongoā and its on-going contribution toward the wellbeing of future generations. The WRM maara is managed by the Te Waka Kai Ora, world first indigenous verification system, Hua Parakore, which validates food grown with māori values. Local kohanga reo, Tu Roa , and He iti naa mootai are also part of the Hua parakore system, with Otaki school recently on board. The international speaking group, sponsored by the organics sector, enjoyed the connection with some local growers, and left behind an abundance of enthusiasm for growing organically and working with nature.